Thousands of Palestinians demonstrated Friday at the funeral in East Jerusalem of the 16-year-old youth kidnapped and murdered Wednesday in an evident revenge killing by ultra-right Jewish nationalists. 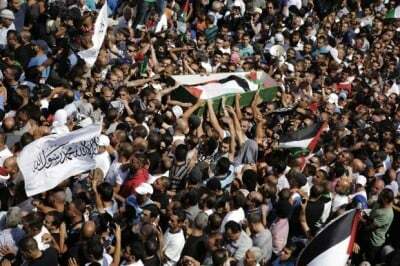 The throng carried aloft the coffin of Muhammad Hussein Abu Khudair and shouted slogans calling for a new “Intifada,” or popular uprising, against Israeli repression. Israeli riot police massed along the route of the funeral march in the Shuafat neighborhood where Khudair lived and was abducted while waiting at a shop near his home to go to morning prayers. The police attacked demonstrators with stun grenades, tear gas and rubber bullets. The Red Crescent said some 30 Palestinians were injured by rubber bullets fired by Israeli forces. Dozens more were treated for tear gas inhalation. Clashes between Israeli forces and Palestinian protesters also occurred in other parts of East Jerusalem, including the neighborhoods of Ras al-Amud and Wadi al-Joz. There were also incidences of rock-throwing by Palestinian youth and Israeli police reprisals near the Al Aqsa Mosque complex, which the government had closed to all men under 50 years of age. A video widely circulated on the Internet shows two Israeli police savagely beating a Palestinian demonstrator who is lying helpless on the ground, then dragging him away. Fighting occurred as well on the West Bank. On Friday, eight Palestinians were said to have been injured in clashes with the Israel Defense Forces in Ramallah. The West Bank, which is controlled by the US- and Israeli-supported Palestinian Authority, has been the target of mass arrests and harassment by Israeli forces since the disappearance June 12 of three Israeli teenagers who lived in settlements near Hebron. The government of Prime Minister Benjamin Netanyahu immediately blamed the Islamist Hamas, which controls the Gaza Strip, for the abductions, without providing any evidence to back up its claims. Hamas has denied any involvement. The discovery on Monday of the bodies of the three Israeli youth—Gilad Shaer and Naftali Fraenkel, both 16, and Eyal Yifrah, 19—was seized on by Netanyahu to launch air strikes against Gaza, mobilize Israeli troops to the border, and threaten another invasion of the impoverished territory. The Israeli government is utilizing the tragic deaths of the Jewish youth to press its demand that Palestinian Authority President Mahmoud Abbas disavow his announcement last April of a unity government between his Fatah-led authority and Hamas. Netanyahu seized on that announcement to break off so-called “peace” negotiations that were being overseen by the United States. Israel launched three new air strikes Friday evening, this time against the southern Gaza town of Rafah. The Israeli air strikes, using the most advanced weaponry, are said to be in response to the firing of crude rockets and mortars from Gaza into southern Israel. Hamas and other groups began launching rockets several weeks ago in response to the mass arrest of Hamas supporters on the West Bank. Israeli officials said 18 rockets from Gaza struck southern Israel on Friday. The military says some 150 rockets have been fired at southern Israel in recent weeks. The air force has responded with air strikes against 70 targets in Gaza, according to the military. On Thursday, at a celebration of the July 4 Independence Day holiday at the residence of the US ambassador, Netanyahu threatened to respond with “full force” if the rocket launches continued. There were reports Friday of negotiations for a cease-fire between Israel and Hamas, brokered by Egypt. Unnamed Hamas officials said they supported a truce and expected one to be announced. Israeli officials made no comment on the claim, however. Instead, Netanyahu said his government would delay any major military escalation for 24 hours while cease-fire talks continued. Meanwhile, Israeli authorities claim to have been unable to determine either the perpetrators or the motive for the killing of Khudair. This is despite eyewitness reports that the men who bundled the Palestinian youth into a car were Jewish, and the fact that the victim’s family supplied the police with vehicle’s license plate. Moreover, the abduction and murder of Khudair came only hours after several hundred ultra-right and pro-settler Israelis held a march through East Jerusalem Tuesday night in which they chanted “death to the Arabs” and attacked Palestinian passers-by. The right-wing rampage followed Tuesday’s nationally televised funeral of the murdered Israeli teenagers. Israeli authorities seem to be encouraging rumors that the teenager’s death was the result of an “honor killing” carried out by members of his family because he was supposedly gay. The family of the slain youth has denounced these claims and the insistence of Israeli police on questioning the youth’s cousins on their possible involvement in the crime. The government’s posture of strict agnosticism as to the perpetrators of the Khudair murder stands in glaring contradiction to its blanket and unsubstantiated claim of Hamas’ responsibility for the killing of the Israeli youth, a contradiction that is ignored in the American media. The attempt of Netanyahu to use the deaths of the Israeli teens as the pretext for stepped up aggression against the Palestinians, and the racist and fascistic agitation of pro-settler elements, prompted some 3,000 mostly young Israelis to stage a rally for peace and tolerance on Wednesday. Powerful sections of the Israeli political and media establishment, on the other hand, are agitating for all out war with overtones of genocide against the Palestinians. Israeli Foreign Minister Avigdor Liberman traveled Friday to Sderot, the Israeli town that borders Gaza and has been the main target of Hamas rockets, where he attacked Netanyahu for being insufficiently ruthless. “Not all terrorist targets can be destroyed from the air,” he declared. “Most of the rocket production sites are under schools, hospitals and mosques. We are only postponing a problem instead of dealing with it.” He went on to call for the assassination of key Hamas leaders.